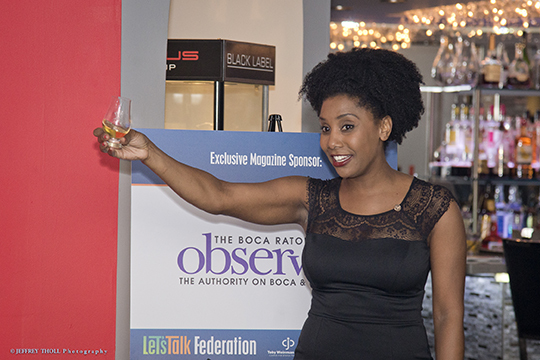 The Men’s Division of the Jewish Federation of South Palm Beach County hosted a Sip & Savor Scotch and Cigar Experience at Diplomat Cigar Bar in Boca Raton on March 9. The event, chaired by Ira Holz, Ken Lebersfeld and Chuck Lichtman, brought together professionals from across the community to network, mingle and enjoy a spirits tasting with whiskey expert and Glenfiddich Ambassador Tracie Franklin. Thank you to our generous sponsors: The Sandelman Foundation, Men’s Division Sponsor; Berger Singerman, CM Graphics, Greenberg Traurig, Greenbrier, HJ Sims and the Mordis Group of Merrill Lynch, Event Sponsors; The Boca Raton Observer, Exclusive Magazine Sponsor; and Southern Glazer’s Wine & Spirits, The Diplomat Cigar Lounge and Glenfiddich, Corporate In-Kind Sponsors.